Parts of northern Queensland have received close to one metre of rain during the last four days, with more heavy falls to come. The monsoon trough and a tropical low are causing a burst of heavy rain and thunderstorms to northern Queensland this week. Between 9am Monday and 9am on Thursday, 858mm of rain was recorded at Upper Bluewater to the west of Townsville, with 619mm falling within the last 48 hours of this period. Nearby, another gauge at Woolshed collected 699mm of rain during the 96 hours to 9am on Thursday. This site only received 751mm of rain during 2018 and hasn't seen this much rain during any calendar month since 2012. Further south, a rain gauge at Sandy Plateau, to the north of Mackay, received 1,074mm during the last four days, with 989mm falling during 72 hours. Rainfall of this intensity is seldom experienced outside the tropics in Australia. Brisbane's highest rainfall total on record during an entire month was 1,025.9mm in February 1893. Even parts of parched northwestern Queensland have picked up some heavy rain from this system. A gauge at Landsborough Highway to the south of Cloncurry received 129mm during the 24 hours to 9am on Friday. This comes less than a week after Cloncurry ended a record-breaking 43 day spell of 40 degree days. This week's deluge has triggered both flash flooding and major riverine flooding in parts of northern Queensland. Fortunately, floodwaters that inundated homes in the Bluewater region on Wednesday had receded on Thursday morning. However, the flood threat hasn't passed yet. 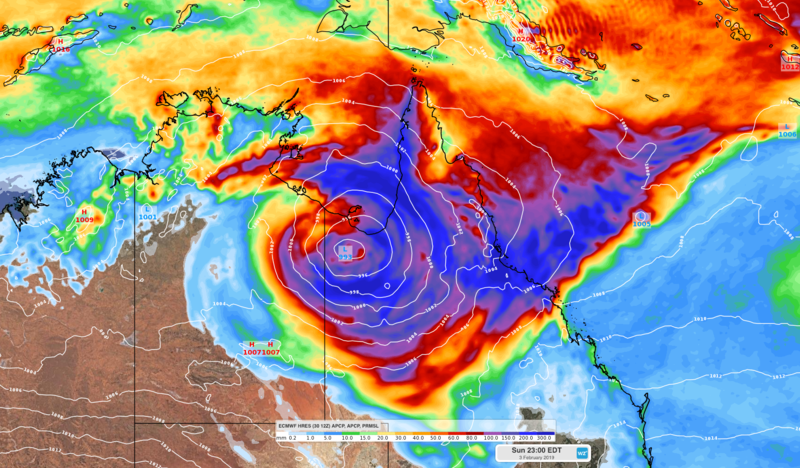 The monsoon trough and large tropical low will linger over northern Queensland during the rest of this week and likely into next week as well. This will continue to produce areas of heavy rain and thunderstorms on a daily basis, which is likely to produce more flooding. Image: Predicted accumulated rainfall between Thursday and Sunday this week, according to the ECMWF-HRES model. As of 9am on Thursday, a severe weather warning was in place for heavy rain in parts of the Herbert and Lower Burdekin and Northern Tropical Coast and Tablelands Districts. A large number of flood warnings and a flood watch were also in place in a multiple river catchments across the tropics. The tropical low won't become a tropical cyclone as long as it remains over Queensland's Gulf Country. However, it it moves over the southern Gulf of Carpentaria later in the week or early next week, the chance of tropical cyclone development will increase.